In this article you will learn how to merge duplicate contacts in Outlook 2010, Outlook 2013 and Outlook 2016 without using any third-party tools, and how to keep your contact list clean in the future. Microsoft Outlook provides loads of handy tools that we use and love and even more features that we are unaware of. But regrettably, an option to dedupe the address book and combine multiple duplicate contacts into one is not on board. Luckily, we are not limited to use only those tools that Outlook provides explicitly. With just a little creativity you can figure out a way to solve any, or nearly any, task you are faced with. Further on in this article you will find how you can check your Outlook contacts for duplicates and merge them without using any third-party software. The most common reason that leads to duplication is dragging a message to the Contacts folder in the Navigation pane in order to have a contact created automatically. Of course, this is the fastest way to add a new contact in Outlook and there's nothing wrong about it. However, if you also create contacts manually once in a while, you may end up having multiple contacts for the same person, e.g. if you misspell the contact's name or enter it in a different way. Another scenario that leads to contact duplication is when a person emails you from different accounts, e.g. using his or her corporate email address and a personal Gmail address. 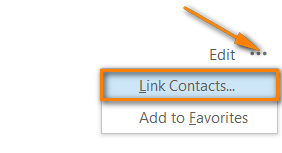 In this case, no matter how you create a new contact, by dragging a message to the Contacts folder or by clicking the "New Contact" button on the ribbon, an additional contact for the same person will be created anyway. Synchronization with a laptop or mobile device as well as with social platforms such as LinkedIn, Facebook and Twitter, may also produce duplicate contacts. For example, if the same person is listed under different names in different address books, say Robert Smith, Bob Smith and Robert B. Smith, nothing prevents multiple contacts from being created in your Outlook. If you work in a corporate environment, duplicate contacts may emerge in case your company maintains several address books on its Exchange servers. I think there's no need to explain what problems you might have when important details are scattered across several duplicated contacts in your Outlook. If you are reading this article, then most likely you are looking for a solution to sort it out. And below you will find a number of solutions to choose from. In most cases Outlook is smart enough to prevent duplication when you are trying to create a contact that already exists. However, if you already have a number of duplicate contacts in your address book, you need to apply a special technique to clean up the mess. Okay, let's get started! Note. To permanent accidental loss of data, we strongly recommend that you make a backup copy first, for example by exporting your Outlook contacts to Excel. Create a new Contacts folder. In Outlook Contacts, right click on your current Contacts folder and select New Folder… from the context menu. Give a name to this folder, let's call it Merge dupes for this example. 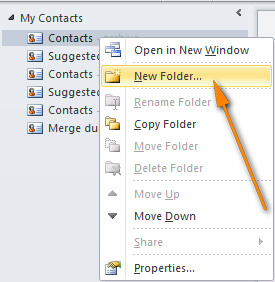 Move all your Outlook contacts to the newly created folder. Switch to your current contacts folder and press CTRL+A to select all the contacts, then hit CTRL+SHIFT+V to move them to the newly created folder (Merge dupes folder). Tip: If you are not very comfortable with shortcuts, you can simply right-click the selected contacts and choose Move from the context menu. 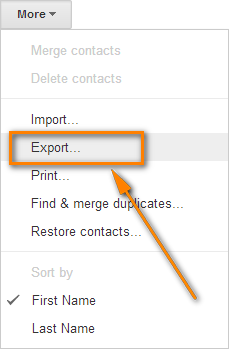 Export the contacts to a .csv file using "Import and Export" wizard. In Outlook 2010, Outlook 2013, and Outlook 2016, go to File > Open > Import. Step 1. "Export to a File". Step 2. "Comma Separated Values (Windows)". Step 3. Select the Merge dupes folder you created earlier. Step 4. Choose the destination folder to save the .csv file. Step 5. Click Finish to complete the export process. And here is what we have after using the Combine Rows Wizard. If you are interested to try the Combine Rows Wizard on your own data, you can download a fully-functional trial version here. Import contacts from the CSV file to your default Contacts folder. Step 1. "Import from another program or file". Step 3. Browse to the exported .csv file. Step 4. Be sure to select "Do not import duplicate items". This is the key option that does the trick! Step 5. Select your main Contacts folder, which is currently empty, as the destination folder to import the contacts to. Merge the deduped contacts with the original ones. 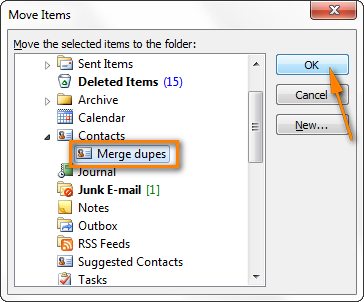 Now you need to merge the deduped contacts that are currently in your main Contacts folder with the original contacts that reside in the Merge dupes folder, so that no contact details will get lost. Open the Merge dupes folder and press CTRL+A to select all the contacts. Then press CTRL+SHIFT+V and choose to move the contacts to your main Contacts folder. When a duplicate is detected, Outlook will throw a pop-up message suggesting that you update information of the existing contact and display a preview of data that will be added or updated, as shown in the screenshot below. Note: If you've used the Combine Rows Wizard to merge duplicated rows in the CSV file, this step is not actually needed, because all contact details were merged in a CSV file and are already in your main Contacts folder. Choose Update if these are duplicate contacts and you want to merge them. Choose Add new contact if they are, in fact, two different contacts. If you want to expedite the process, click Update All and all changes will be accepted automatically in all duplicate contacts. If you want to review a particular contact later, click Skip. 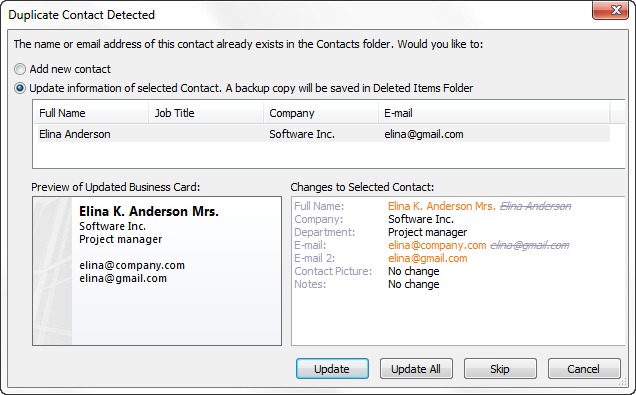 In this case the original contact item will remain in the Merge dupes folder. When Outlook detects a duplicate contact with a different email address and you choose to update a contact, the current email address of the contact will be moved to the "E-mail 2" field, as shown in the screenshot above. Note: If your Outlook does not show this dialog when you are adding duplicate contacts, then most likely the duplicate contact detector is off. See how to enable Check for Duplicate Contacts feature. If you have a Gmail email account (I guess most people do these days), you can use it to merge duplicate Outlook contacts. In a nutshell, the procedure is as follows. 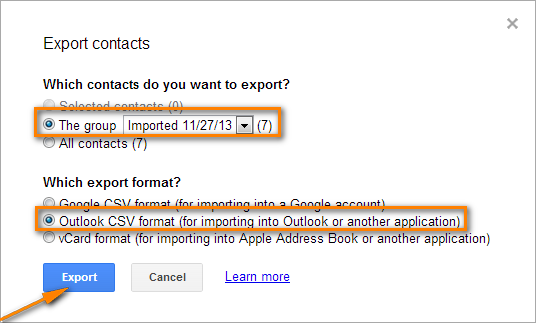 Export your Outlook contacts to a .csv file, import that file to your Gmail account, use "Find and merge duplicates" function available in Gmail, and finally import the deduped contacts back to Outlook. 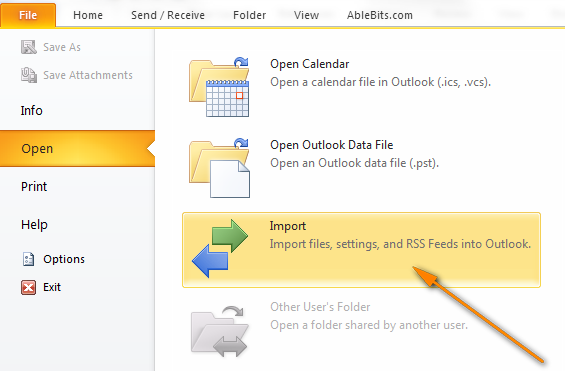 Export your Outlook contacts to a CSV file, as described in step 3 above (File tab > Open > Import > Export to a file > Comma Separated File (Windows)). Click the Choose File button and browse to the CSV file you created in step 1. Gmail creates a new contact group for each imported file so that you can easily access and review it later. After importing is complete, click the Find & merge duplicates link. A list of found duplicate contacts is displayed and you can click the expand link to review and verify the contacts to be merged. If everything is Okay, click Merge. 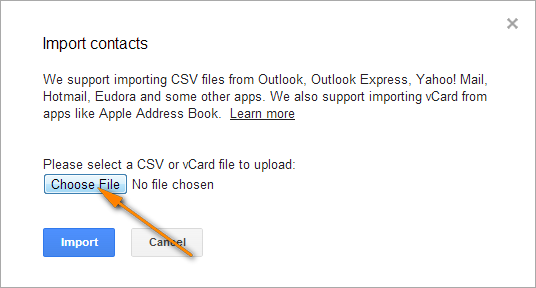 In Gmail, click More > Export... to transfer the merged contacts back to Outlook. 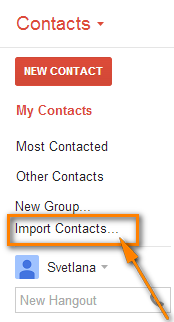 Under "Which contacts do you want to export", choose whether to export all the contacts or a particular group only. If you want to export only those contacts that you imported from Outlook, it stands to reason to select the corresponding Imported group. Under "Which export format", select Outlook CSV format. Then click the Export button to finish the export process. Finally, import the merged contacts back into Outlook, as described in step 4 of the previous method. Remember to select "Do not import duplicate items"! Tip: Before importing the merge contacts from Gmail, you can move all contacts from your main Outlook folder to a backup folder to avoid creating more duplicates. 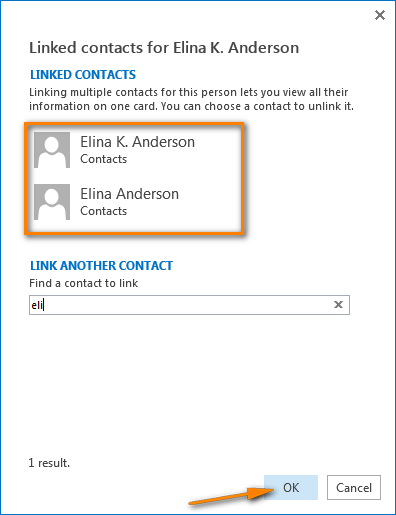 If you are using Outlook 2013 or Outlook 2016, you can quickly combine several contacts related to the same person using the Link Contacts option. Open your contacts list by clicking People at the bottom of the Navigation pane. Click on the contact you want to merge to select it. Then click the small dots button next to Edit to open the drop-down menu, and choose Link Contacts from the list. 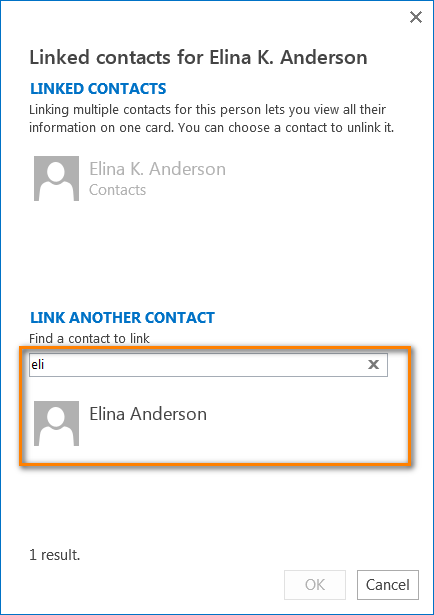 Under the Link Another Contacts section, start typing a name of the person you want to link in the search field, and as you type Outlook will display all contacts that match your search. Choose the needed contact(s) from the result list and click on it. The selected contacts will be merged straight away and you will see their names under the Linked Contacts heading. All you need to do is click OK to save the changes. Of course, the Link Contacts feature is not the best choice to clean up a large contacts list cluttered with duplicates, but it will definitely help you quickly merge a few identical contacts into a single one. Go to the File tab > Options > Contacts. Under "Names and filing", select Check for Duplicate Contacts When Saving New Contacts and click OK.
Yep, it's as easy as that! From now on, Outlook will suggest merging a new contact you're adding with the existing one, if they both have a similar name or identical email address. Hopefully, now you have a clean and neat contacts list in your Outlook and know how to maintain the order. Thank you for reading! 71 Responses to "How to merge duplicate contacts in Outlook 2016, 2013 and 2010"
Worked like a charm. Especially liked your shortcuts! Thanks. I am glad to know it worked for you. Thanks for your comment! Hi Svetlana, I have to tell you how grateful I am for finding this piece, it was so helpful. I'll share the link with colleagues who will be very happy to find it's not a dreadful process after all. Simply fantastic, thank you again. I am wondering how this all works with contacts containing a contact photo. The photo will not export to an Excel csv file. I have had a problem running the Merge Data Add in. I get an exception report and have copied the details. Will email it to you if you give me your email address. Please send the details at support@ablebits.com and we'll do our best to fix the problem as soon as we can. do you know of a consolidate addin for excel 2007 please? We have the Consolidate Worksheets Wizard for Excel that works with all Excel versions including Excel 2007. You can find more details about this add-in and download a trial here. Hopefully this tool will prove useful to you. I followed the aforementioned instruction. The file(s) will not import as they show not to be supported. This is very strange. Please let me know which Office version you use and what exactly the error message says (a screenshot of the error message would be very helpful). This is sick. It's 2014. You used to click a button to merge contact. Now you need a degree to do it. A new version of Google Apps Sync (available in paid accounts) syncs contacts as well as calendars and other items. As a free alternative, you can check out one of the third party tools: gSyncit (described in this article), GO Contact Sync Mod (open source tool to synchronize Outlook contacts with Google Mail), Local Sync, Contacts Sync (paid and free versions are available). how can upload the Bulk photo to outlook contacts? To my best knowledge, this is not possible. Very useful article. 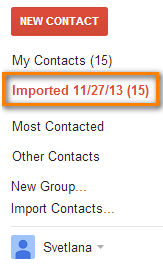 One thing that still troubles me is what happens to phone numbers when re-importing them. This seems to give mixed results. It's hard to say when may cause this without seeing your entries. Can you please send us a screenshot of the "mixed results" at support@ablebits.com so that I understand the problem better? I am trying to find a way of mass deleting all duplicates in my contacts. I have too many to try to do this one by one or by clicking all the way through. What a mess! and I also have to switch cell phones so it may happen again! Can you help me with any suggestions? Thanks so so much. You can consider using the ODIR add-in. Please check out this article for full details - Remove duplicate emails in Outlook 2010 and 2013. "This is sick. It’s 2014." Your comment is not needed thank you very much ! You are obviously surfing to get something for free, so if you don't like it go somewhere else !!! Pity I cannot see your E-mail address!! Svetlana, thanks very much for this much needed "program", I will definitely use it and are keeping your address so I can purchase some other programs from you! Thank you very much for a thumb up, I really appreciate it! This really helped. Thanks. More so for making the steps so simple and easy to apply! For some reason I was not able to download the excel add-in (trial version). I have another problem. My office uses MS Exchange (hosted server). I am being told that the contact detail fields in Exchange are far limited in comparison to that in the Outlook. SO there is no way to have my colleague's second (personal) email address saved or even their personal mobile number. We used to have all this earlier where the Admin would circulate details of the new joiness. I find this pretty retarded. The only solution my IT is offering is that of manually adding these details in Outlook after the contacts are imported from Exchange's Global Address Book. Have you come across this issue and any thoughts? I downloaded the trial version of the combined rows wizard and it worked great! Easy to use, and I needed it badly. I had a lot of cross-linked records (corrupt data) that caused a ton of duplicates. It took 2,451 rows and merged them down into 36! Then I just searched the spreadsheet for semicolons and made decisions of what to keep vs. trash. One thing I'm unsure of is which "wins" between the Office 365 Exchange Server and Outlook. Hopefully Outlook wins, so all those duplicates will be deleted from my contacts on Office 365. Taking it further, I then hope that Exchange wins and pushes the changes down to iPad & iPhone, which also have those 2,000+ dupes. Any idea how those syncs work? Thanks for a great article and great Excel add-in! Every time I try to scroll through my iPhone's contacts there are literally hundreds of entries for the same person, so hopefully this will resolve it...? I am really glad to know the Combined Rows Wizard has been helpful to you, thank you very much for your feedback! Sorry, I cannot state anything with certainly regarding iPad & iPhone because I have different sets of contacts in Outlook and iPhone (business vs. personal : ) Usually, there is a setting to mark the main contacts, so in theory, syncing contacts with Outlook should resolve the issue. Anyway, I would strongly advise to backup the iPhone right before syncing the contacts in case something goes wrong. Great stuff, used the merge duplicate contacts in 2013 and it worked a treat. Not sure why you need "merge the dupecontacts with the original" stage but i followed every step and it worked just great. Sorry, we are not able to help with this issue. I can only advise contacting the Microsoft support service. I found that dragging all of my contacts to the newly created folder to move them and then repeating that to move them all back, Outlook checks for duplicates. It's an even simpler method than what you have outlined here. Thank you. Works like magic. I have Outlook 2010 for windows and also use icloud. Under Outlook I have "Outlook" files listed under My Contacts and "iCloud" files. I prefer to use the iCloud files so that info will go to my iphone. I also have folders created for different types of contacts, i.e. Christmas Card, Teams, etc. Is there a way that my contacts won't be duplicated if they are in more than one folder? Sorry, we cannot help you with this. Looks like your task can be fulfilled only with a custom solution. 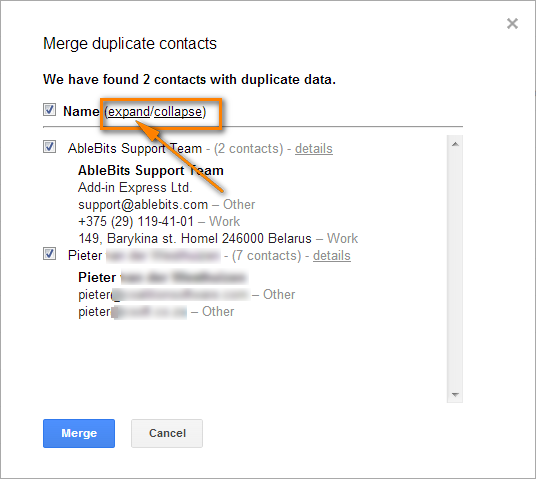 Thank you - very clever 'indirect' way of merging duplicate contacts! Baffled! I am trying to follow the 2013 instructions, I click on People and the list appears, I click on the first of the contacts to link, but nowhere that I can see is there something that says edit or the three dots. Where on the screen should I be looking? Thank you for any assistance. Please make sure you have the Reading pane visible for the Contacts folder you selected. 1. Select the View tab on the ribbon. 2. Go to the Layout group. 3. Reading Pane - the Right value should be selected. Then you can find the "Edit" and "..." buttons to the right of Outlook Reading Pane. Thanks! The .csv trick worked great, and saved me a lot of time. I had a mess of duplicates in my Outlook. I followed the procedure above and tried the Excel Add-in and it worked beautifully. Thank you very much! Looks like you need a custom VBA function to generate the correct CSV file. Sorry we cannot assist you better. I stumbled on what I think is a lot simpler/easier method: Just select and drag the duplicate contacts to another contact folder and hit undo (ctl-z). When Outlook is moving the contacts back it triggers the "Duplicate Contact Detected" dialog where you click update and it merges the two. Quite complicated method described above. In newest Android phones I found merge command. There are also external apps for deduplication, some other contact managers offer merge function on selected contacts. Shame that Outlook doesn't have these very desired functions (merge and remove duplicates). I'm using freeware ODIR to remove duplicates, but ODIR doesn't work in Outlook 2013 anymore. On Android there are also some apps for duplicate removal. Thank you for your comment. Hope Microsoft will implement these helpful options one day. I just merged a backed up PST with the OST recently.Now some contacts does not show up.I shows up on the phone,I checked its not in the Phone memory. Also some emails does not show up, I checked the Indexing status it shows completed. I deleted the company email in my GM's mobile as we migrated our mails from Managed Microsoft email services(POP3) to Microsoft Exchange. After some time he came to me and said that his contacts are lost. I checked his outlook but he did not have any contacts in it. Can this contacts be retrieved? I don't normally do this, but I wanted to comment just to say thank you. This process and the Combine Rows Wizard worked great. excellent post ! i know now some app on the android phone can eliminate contacts on the phone. 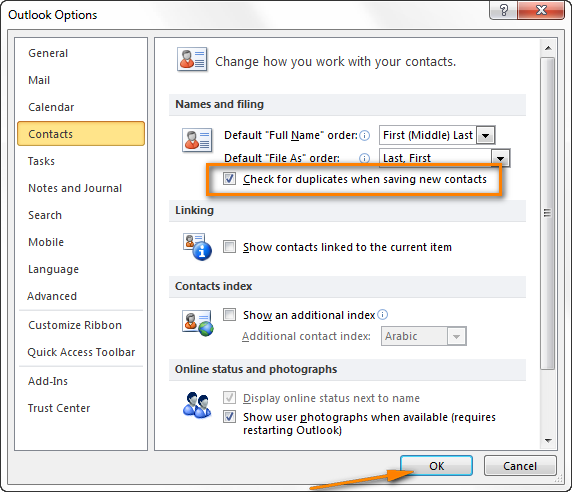 this is a solution for the duplicated contacts on the outlook. Also the mostly common that people duplicate their contacts due to copy the same contact to different folders in order to group or organize the contacts. If you don't want to create duplicate contacts the most acceptable way is to add a "category" for your outlook contacts. you can then view if by grouping the category . Thank you so much for your helpful comment, Tom! First method worked for me on Outlook 2013, with the exception that CTRL-SHIFT-V didn't do anything, but CTRL-V did. Brilliant tutorial and method! Thanks. 2. give this duplicate check capability on import...like the old days. 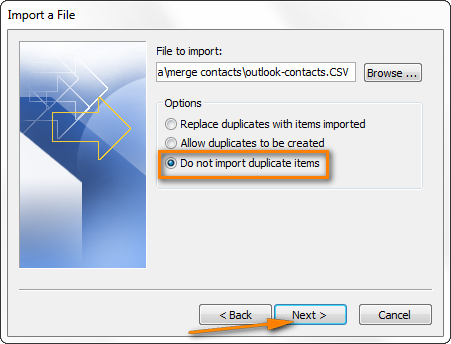 How i can merge duplicate contact in outlook 2013? m trying to do it but its not worked out. Hi this works great for Contacts i went through the whole tutorial and it worked perfectly, now how do i put all these contacts into the separate ms outlook "address book" which appears to be the old contacts with all the duplicates in it? For us to be able to help you better, please give us more details about your task. Please clarify what you mean by "appears to be the old contacts with all the duplicates in it"? Is there a way to determine which Folder Group a contact belongs to? For example, I have about 15 folder groups. If I look at a listing of all of my contacts from the Contacts group, I see several duplicates. I do not see a "Field" at the top to list what "Folder Group" a contact belongs to and what happens is if I delete a duplicate contact, it deletes the one from a Folder Group and I don't want to delete the ones from Folder Groups, only the duplicates that aren't in any Folder Group. Thanks for your help! As a workaround you can create a custom category for the contacts from each Folder Group and assign it to all contacts from this group. The Categories field will be exported with all information and you will see which group a contact belongs. 1. Go to the Tags ribbon group. 4. Enter the Name and select the color. When I tried to import the .csv file back into my Contacts folder, I got an error message indicting "The file D:\Documents...." is locked. This could be because the disk is locked, the file is read only, in use by another program, or because you do not have permission to use a network path." How do I fix this? This post and string is insane. The steps are silly long and complex for most users. It is easier to live with 2 contacts for the same person. I just switched from Google enterprise. Google did a one button FIND & MERGE to make this happen. It also linked to my LINKEDIN and if someone made a change to their profile like job or title. Find & Merge would change and update. All with one button. I wonder how you can leverage your LinkedIN ownership to make this easy? Does your guide work for Outlook in MS365? When I try to follow the steps, Ctrl A does not highlight the files to be moved. So I highlighted them manually and then the "Merge Dupes" folder does not appear when going to the "Move" steps. Any idea what's happening here? It didn't work. I now have 7748 contacts not 2950! I can see how this works and it is a clever idea but in my case it failed. Can you help me to solve this? I did tick the "Do not import duplicate items" but it actually duplicated them! It also created a message about my junk lists that refused to go away. How would I now best go about testing to see which contacts are still active? With over 10 years of collecting contact information I have to believe some of these are no longer valid. Do you have a recommendation for how to do that efficiently? i went through al the steps you wrote and after i imported the csv file back this is what i got i copy pasted a sample of my contacts now. and now i lost half of my contacts. how do i fix the gibrish? I have a number of contacts in which I will have pasted small image files in the Notes field. This would be such things as a business card scan, or some important notes gotten from a web site. Will these images survive your procedure for elimination of duplicates? If not, do you have a suggestion as to how I can preserve them with the appropriate contact? A common problem I have always had with importing/exporting CSV files: names in foreign languages that use diacritical marks (García, Álvarez, Raúl, Buñuelos, etc.) often do not translate into the new version. Worse than being simply eliminated, however, they show up as the WRONG diacritical marks. For example, "José Luís Ávila" recently came out as "JosÃ© LuÃ­s Ã vila," which is effectively useless. Sometimes it works, but often it does not. Is there any solution for this? This is a known problem with Excel and as such has a number of different solutions depending on which version of Excel you are using. The easiest answer is to suggest you do a search on Excel and UTF-8 characters and see the various solutions. The outlook solution worked for me...after I spend 3 hours figuring out why the Duplicate Contact Detected Wizard didn't show up! I finally figured out that there is a Outlook 2016 setting in "Options - People"-- check the "Check for duplicates when saving new contacts" box!